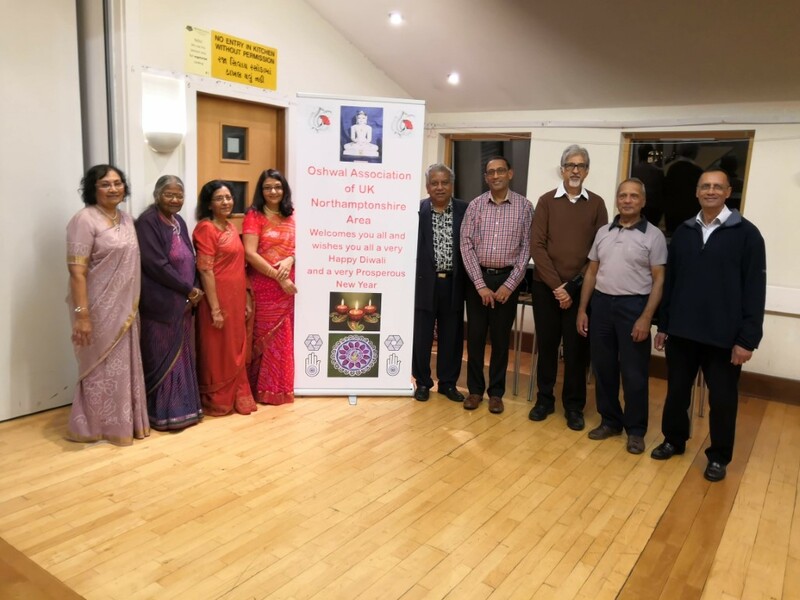 Northampton Deepawali 2018 | Oshwal Association of the U.K.
Northamptonshire area celebrated Deepawali – Get-Together on 10 November 2018. While we were waiting for the all the guests to arrive, music was arranged to start playing garbas, which everybody enjoyed and burnt some calories. Then the guests were welcomed by Bhikubhai, our Chairman. A minute’s silence was observed for our departed Oshwal Members after reciting Navkar Mantra. Guests were mingling together and wishing “Salmubaraak” (Happy New Year) to each other. We had three Rangoli displays by Trishna, Devina and Shreyan which were beautifully done. A wonderful effort by these youngsters. We thank them very much and hope that next year we will have more children to take part in any activity that has been organised for this wonderful occasion of our calendar. After refreshments members were keen to get started with Antakshri (a favourite for the singers) with a twist. Three teams were formed quickly and Jyostnaben and Mahendrabhai got the following rounds going and all participants had lots of fun. Round one was normal Antakshri and each team had to sing starting with the last letter that the previous team ended the song with. Round two was a word round and the word picked by each team had to fit in the “Antra” of the song. Amazingly all three teams were brilliant and managed to sing within given time. Round three was a vision round where teams had to guess from the picture the name of the Bollywood film and sing the relevant song. Again, with some clues given most teams managed to get this round correct. Oshwal Association of Northampton Area wishes everybody a Happy and a Very Prosperous Year with lots of abundance.